Why workers serving at missionary schools play an integral part in international ministry. 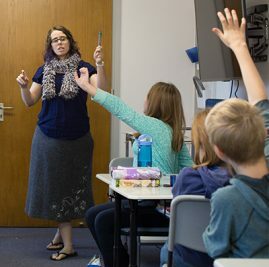 WorldVenture often tells its missionaries, “You have to educate your children; we don’t tell you how.” Many options exist for missionary parents, from homeschooling to international schools, online school to national schools. Every child, situation, and country is different. However, many staff at international Christian schools still face a wide variety of criticism from their supporters and connections in America, even they serve students and families around the world in many crucial ways. True gospel influence in a cross-cultural community does not happen in a day, but a decade. An integral piece in keeping missionaries on the field is being able to provide them with quality, consistent education for their children. Educators are indirectly fueling the ministry of parents by providing a safe, loving environment for their children. In addition, many of these schools operate like hubs where outreach takes place in surrounding communities. TCKs, while having the potential to be exciting and effective messengers of the gospel throughout the world, need the nurture and guidance of trained, passionate professionals to mentor them through their transitional upbringing. 2. Boarding schools tear families apart and loving parents don’t send their kids to them. In some parts of the world, boarding school is the safest and most loving option for missionary parents, although it’s never easy to part ways. International schools offer more opportunities for a child whose missionary parents may be in a remote area with no friends, sports, or other activities for development. In some places, homeschooling is illegal. Fewer missionaries in 2016 are serving in the same place for 30 to 40 years anymore; more and more are serving for two to three years before relocating. This constant transition is harder on children, and some parents decide a safe, stable environment—like an international Christian school—is better for them than constant uprooting. Oftentimes, it’s the stability of a healthy marriage at home that matters most to a child, rather than going to boarding school. 3. Missionaries should send their children to national schools to create more inroads for ministry and community. Not knowing the language before enrolling into a national school can make academic success nearly impossible. In addition, depending on the location, national schools can operate out of a shame-based mindset or even use corporal punishment, and many don’t have options for children with learning difficulties. If students want to eventually return to the states for college, many national schools won’t give them the proper preparation to do so. All of these factors can reduce the likelihood of national schools being an option for TCKs. Read our cover story featuring WorldVenture missionaries serving TCKs, and why TCK education matters around the world.